Individuals that own businesses, whether large or small, require the proper documentation for all transactions, which are quotation templates. 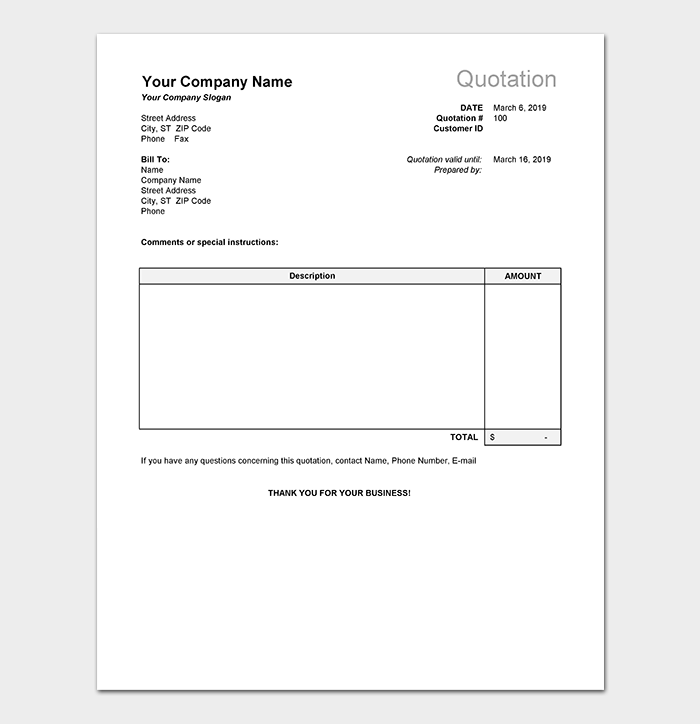 Quotation forms are utilized when a vendor needs to communicate to a buyer the cost and terms involved in a transaction. In order to simplify this task, businesses use Quote templates. These Templates will include basic information such as the products/services, price, terms, fees and taxes. Templates will provide the vendor and buyer with an important document regarding the details of the transaction. Our Quotation templates are all designed by professionals and are guaranteed to project a confident and professional image to your clients. 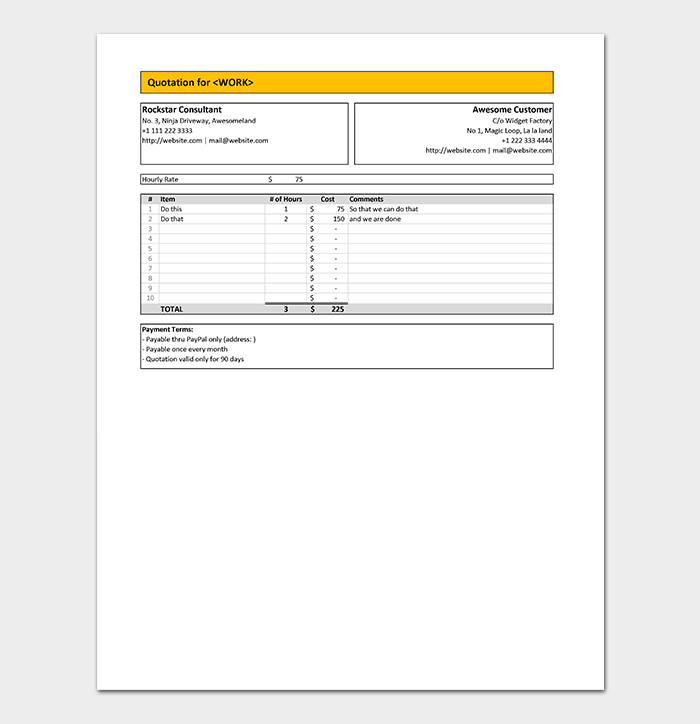 Whether you are a small boutique, or a delivery operation, templates are designed to assist you in keeping track of information in a logical manner. Quote Templates are a solid and time-tested method for documenting the details of a transaction, such as products, services, charges, terms of sale, warranties and contact information. 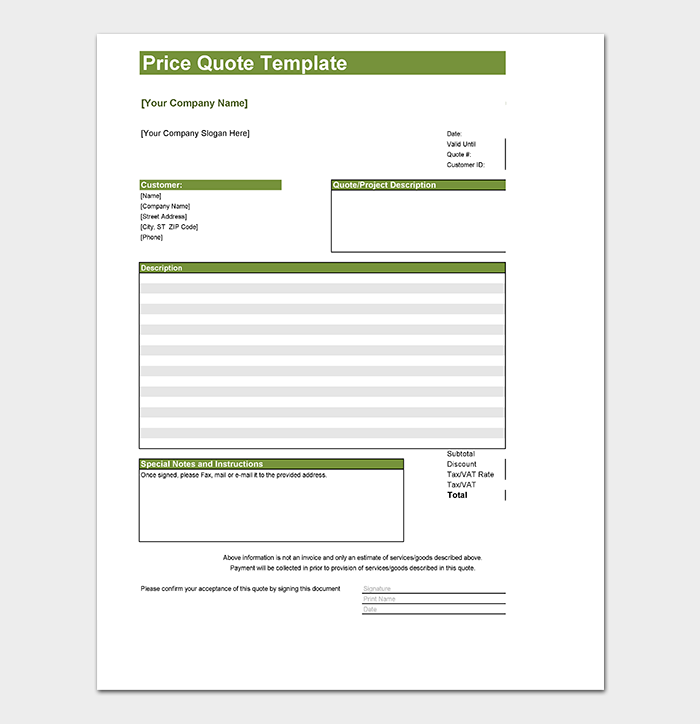 Quotation templates offer both vendor and buyer many advantages. For example, if a purchaser is attempting to stay within budget, they will seek out and collect quotes from a number of vendors in order to get the best deal for themselves. The buyer will study the quotes and determine which has the best price, terms, warranties and discounts. 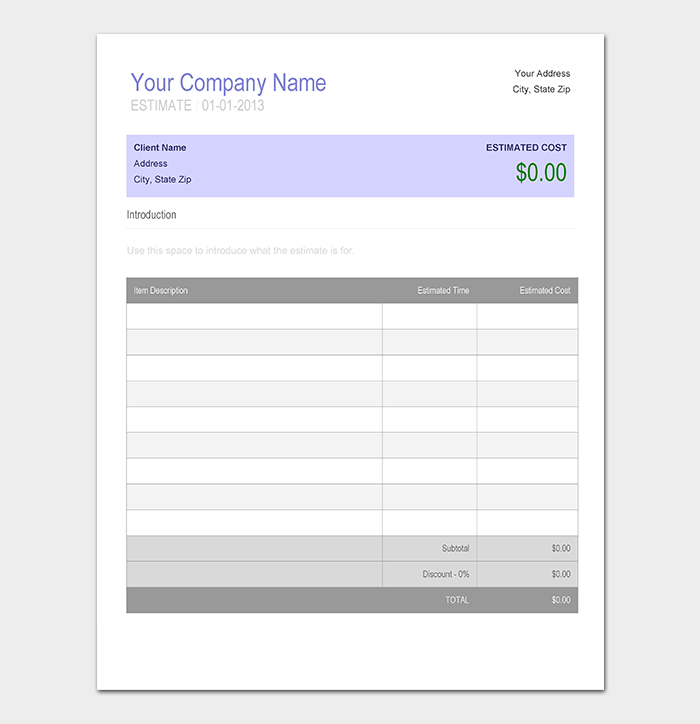 Businesses benefit from templates as well, as they are documents that are used to keep track of transactions, customer information, as well as used in the accounting department when processing expenses, profits and payroll. They are also extremely useful in case an issue arises that requires legal intervention. 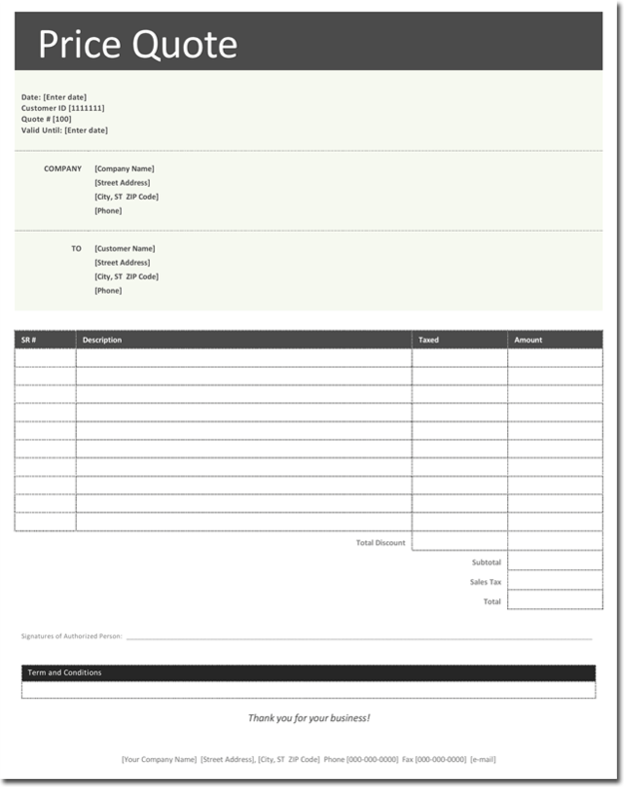 These templates are used to create a form where the business conveys information to the prospective buyer in a way that is concise, logical and easy to comprehend. 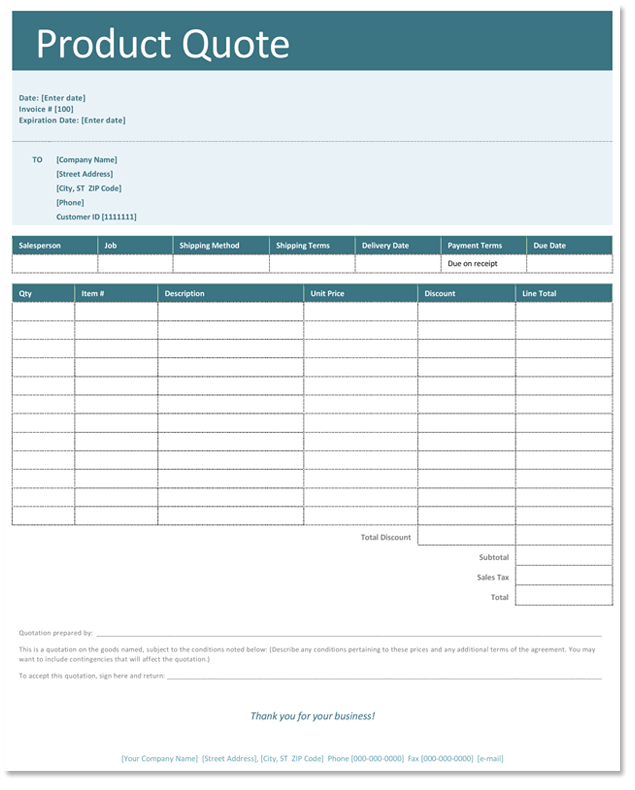 These forms communicate the price, the description, discounts, terms, due dates, along with any other information necessary to complete the transaction. All of the templates and forms you see are not only beautifully designed, but also easy to use, free to download and are compatible with Microsoft® Office 2003 and other latest versions. 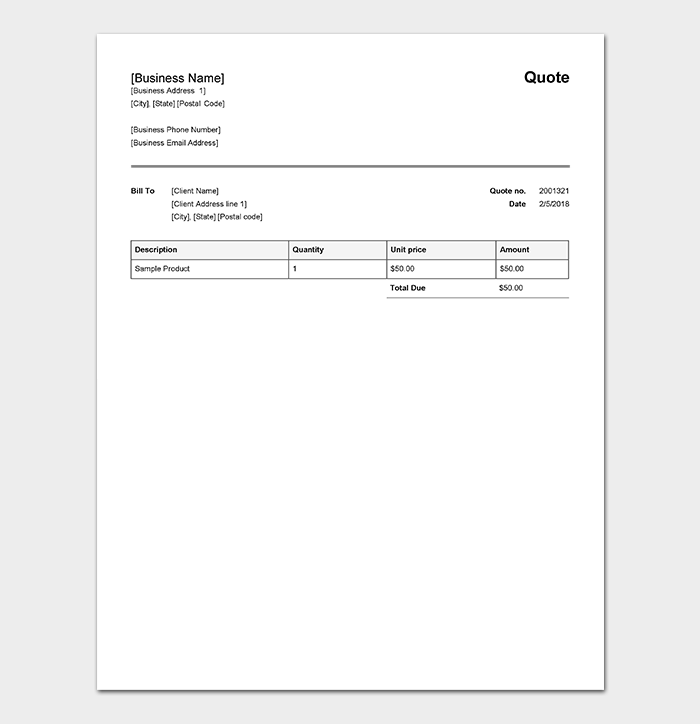 The product quotation template records the product/service and the cost of that product/service along with a proper description. The product quote template is used at the start of a sale, and done in order to initiate a sale between vendor and purchaser. 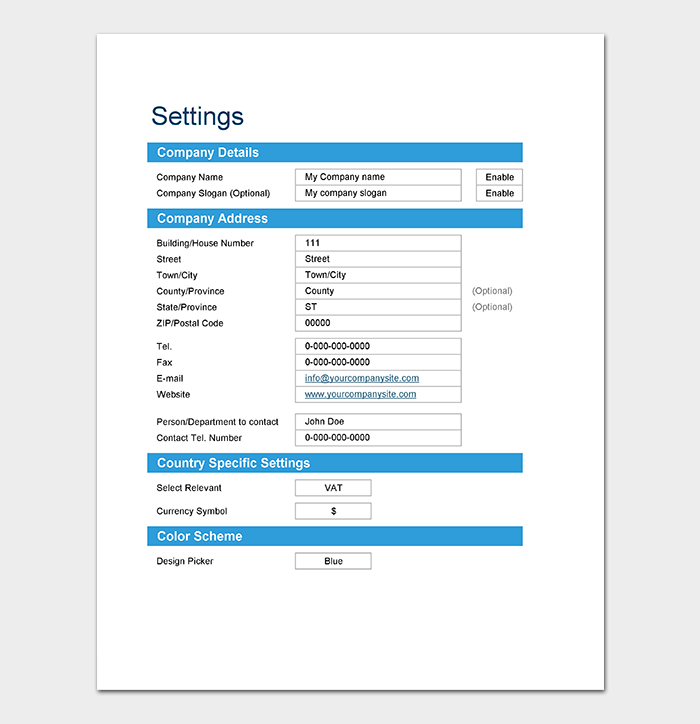 Quote forms take the necessary information and place it in an easy to comprehend layout, which includes a price estimation for a project. 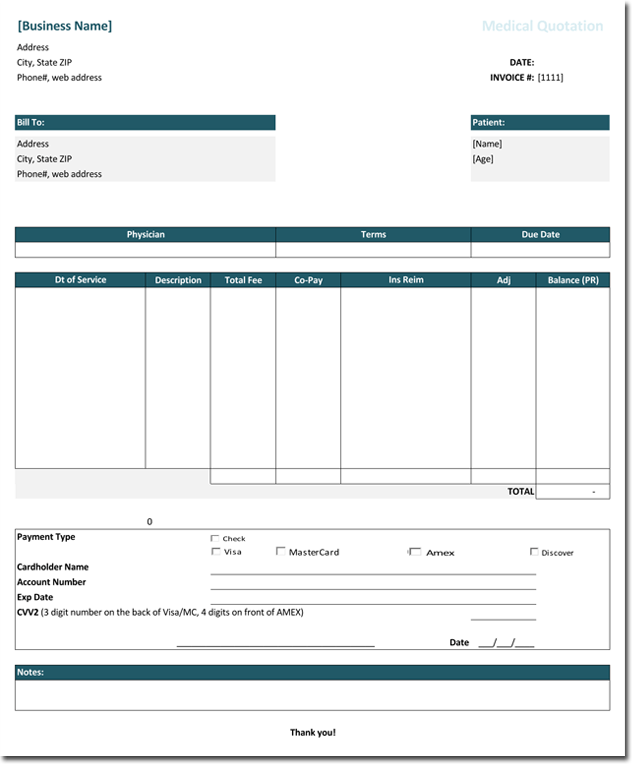 To make this process easier, product quote forms are used. These templates are also referred to as PQT’s and will contain fields for entering information regarding the product, the product number, quantity, signatures, payment/credit terms, contact information. These product Quotations are professionally designed and will put forth a good impression of your business to your prospective client, and are compatible with Microsoft Word and Excel®. All that is required, is a simple and quick download, entering the data, and saving it to file or printing it. By using our templates you can rest assured that you have properly documented the transaction for both client and business. 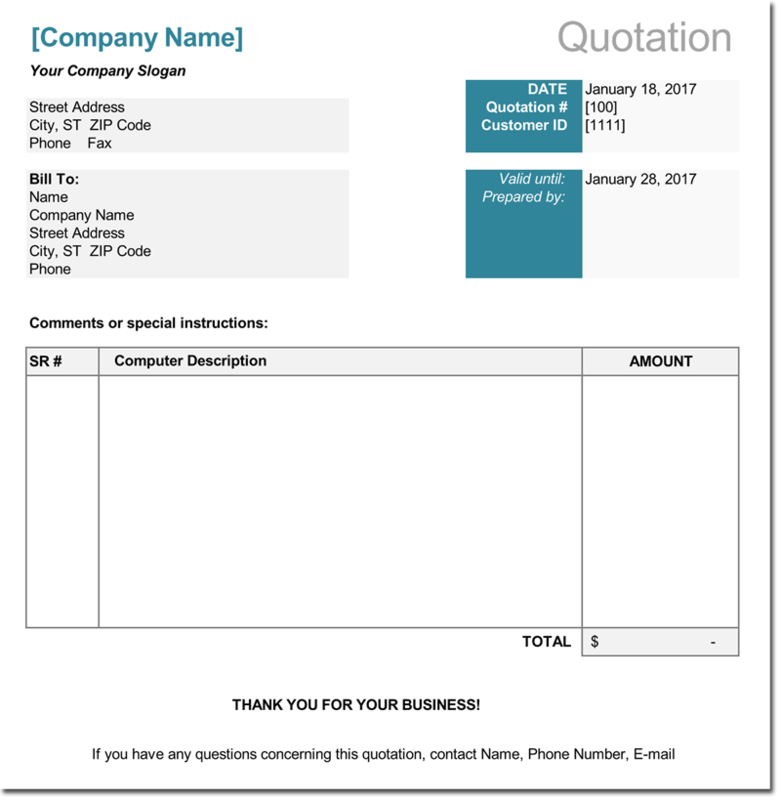 When a business requires a form for transactions where the cost of products/services can vary, they use a sales quotation form. These changes in cost are often due to variables such as labor costs, supplies and materials. 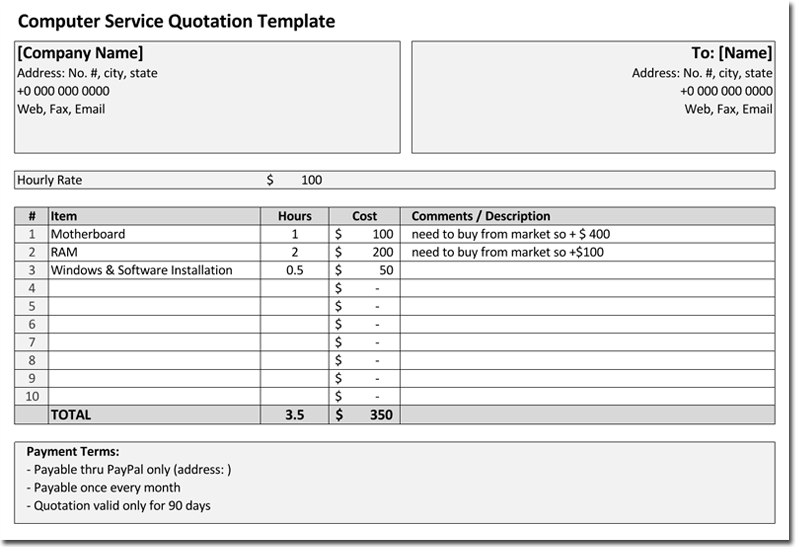 The sales quotation template conveys to the client an estimate of how much the product or service will cost. The template is used to create these forms. This template provides the customer with pertinent information which includes: Contact information, description of products or services offered, terms and conditions, shipping and handling, fees, and any discounts. Sales quotes are utilized for one very important reason. Business is by nature, competitive, and they need to communicate terms in an easy to understand way. Once you download the template, proceed to enter your information for that sale, and either save it or print it. it’s just that simple. Cost effective, convenient and concise, our sales quotations are certain to make your transaction a flawlessly smooth one. For any transaction involving vehicles, the car quotation template is an absolute necessity. This form is used to document an itemized list of all the costs that a salesperson in a car dealership offers to a prospective buyer. When an individual shops for a vehicle the salesperson will provide you with a car quote form or vehicle quote form. This information will include, but not be limited to: The base price of the vehicle, specs, features, and name of the dealership/salesperson. That individual can then visit and browse several dealerships, and use the competitor quotes to initiate a deal for the final vehicle of their choice. In fact, most car salespeople will work hard to beat a competitor’s price in order to grab the sale and its commission. 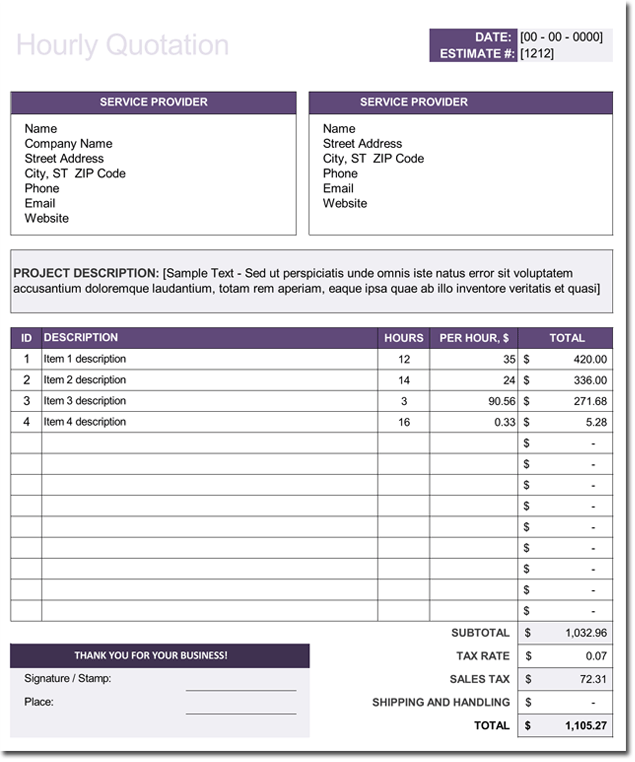 Because of the complexity involved, people choose to utilize quotation forms. These Templates have customizable fields that are suited to the wide array of makes, models, features and discounts found in the world of car dealerships. Our quote formats are free to download and quick to personalize by using Microsoft® Word or Excel. Insurance is a complex topic with a vast variety of options available. In fact, most people become completely overwhelmed when considering insurance types, conditions, add-ons, not to mention the various companies offering coverage. In such cases, an insurance quote can be of great assistance. 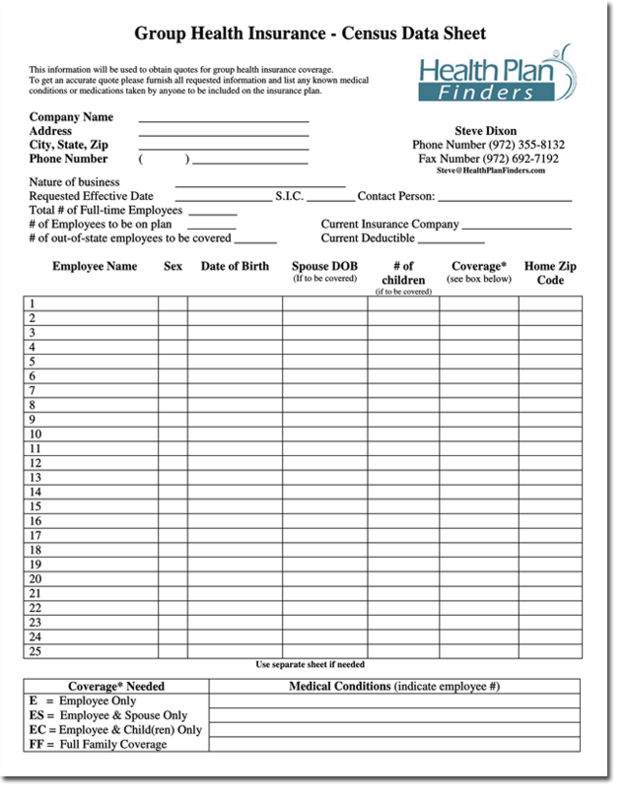 Insurance quotation forms will contain fields for estimates on premiums, terms, and contact information. For example, if you are searching for vehicle insurance, the insurance quote template will have fields for driver information as well as details regarding the make, model, mileage of the vehicle in question. As can be seen, templates can take this complex task and make it orderly and easy to comprehend. Insurance Quotation templates can be utilized for any form of insurance that you see fit: Health, liability, life, vehicle, even pet insurance quotes. Our professionally designed and easy to use insurance forms are available in Microsoft® Word and Excel, and are certain to make your process in searching for that perfect plan an easier one. 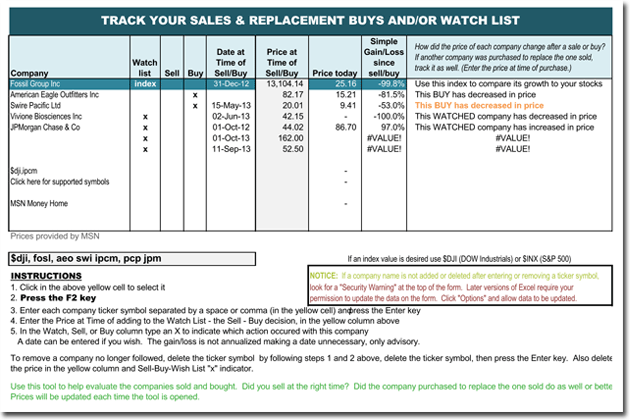 Stock quotes contain information regarding a stock for the purchaser. These stock quotes contain information such as bid, asking price, last traded price and volume traded. In today’s world anyone who has internet access can get information on any publicly traded company and it’s stock. Obtaining stock quotes are extremely important for anyone who is into investing in the stock market, especially when it comes to their portfolio. 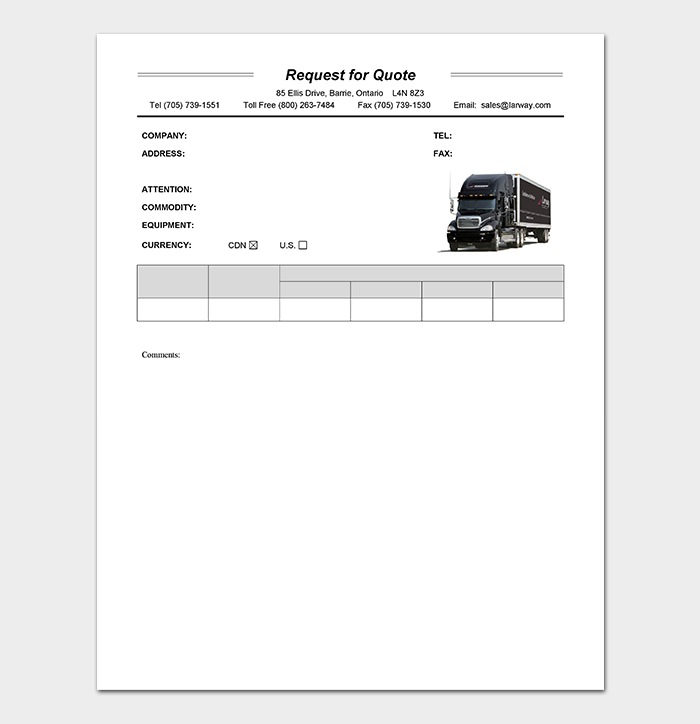 In order to streamline this process, individuals use quote templates. Templates are an easy method to use for the organization of your data. By using our completely customizable stock Quotations, keeping reliable records of your stock quotes for your portfolio is no longer a labor intensive task, but one that is convenient and simple. In a technological world, it is necessary to keep proper records of any maintenance that is required of mechanical assets. Machinery and vehicles work hard and often 24/7, and this means they will require regular maintenance. Whether it is a delivery van or a drill press, in order to make sure the business runs properly, maintenance records are a necessity. Maintenance quotes are an absolute must when it comes to keeping track of maintenance issues such as parts and labor, supplies and materials used. Our maintenance Quotation templates are the perfect solution for workers who need to compile orders for maintenance for machines and vehicles. Whether the maintenance required is for a computer lab, delivery truck or mill, our maintenance quotes can fit the bill, and do it in a convenient and cost effective manner. There are businesses are often require employees to travel. As a result, it’s important to stay within budget. The hotel quotation template offers a great assistance to those who must cut costs. When you use a hotel quote template, it’s extremely easy to go online or call various hotels for quotes in order to do some comparison shopping. 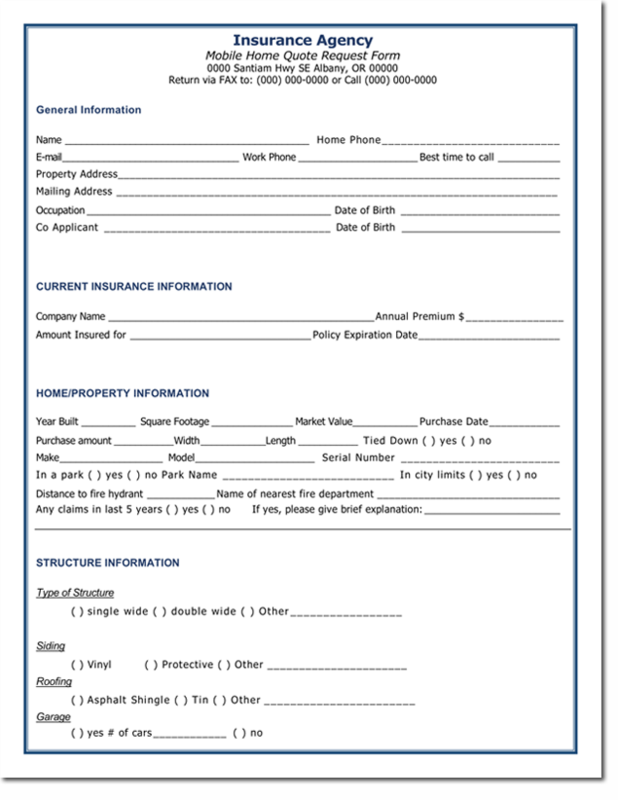 These forms will allow you to make note of the services, fees, terms, length of stay, and discounts that hotels offer. As can be seen, these forms can assist you in staying within budget. Simply download, edit and print or save to file. By using our clear and concise hotel quotations, you will be able to access travel expenses and choose the best deal for your budget. Computers are a part of both office and home life. They are an important tool in managing our data and keeping track of important dates and client information. When a computer breaks down, it needs to be fixed, and fast. Computer service Quotation templates are used by both computer repair shops, in preparing a price quote for a customer, as well as an individual or business. Computer repair companies use quote forms to assess a service job and prepare a quote for the customer. 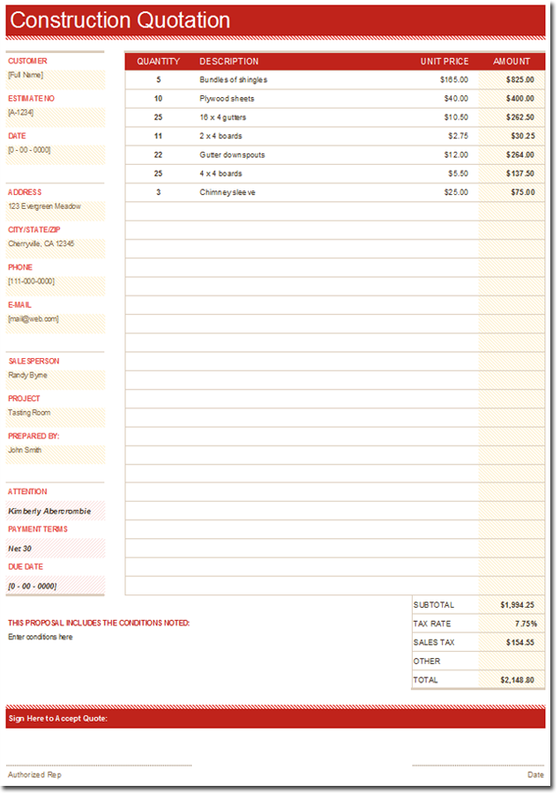 Customers use forms as a way of doing some smart comparison shopping for a reputable computer repair technician. Computer service quotes that we offer are free and easy to edit. When organizations, businesses or groups are in the market to partner with a clinic, medical center or hospital, the medical quotation forms are used to expedite the process. They do this by assisting in evaluating which facility would be most beneficial. 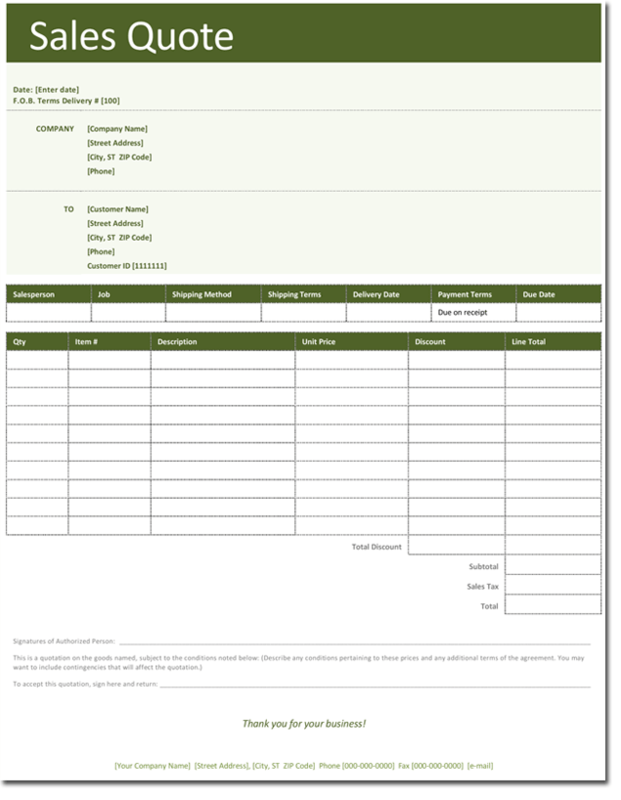 Information contained in the fields on medical quote templates include: Services provided, hours of operation, contact information, payment terms, insurance concerns, and fees. This medical Quotation template is specifically designed to suit this task, and only take a few moments to download and customize. These medical Quotations are free to download and will be easy to edit with Microsoft Excel®. 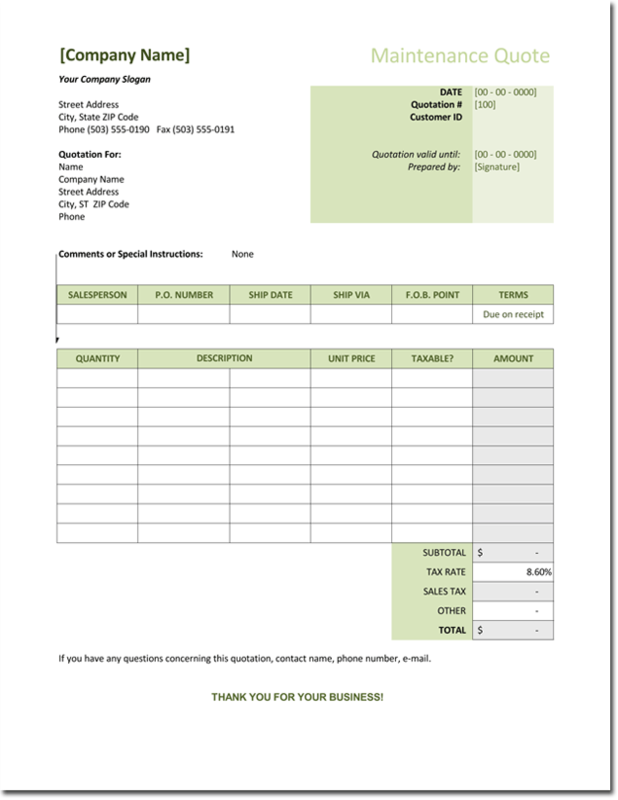 General quote templates are often used in business sales transactions. These forms are one method businesses use to initiate business deals and contacts by way of offering prospective clients quotes on what goods and or services they provide. As a result, the prospective client can do a compare and contrast using this quote by checking out the deals offered by competitors. General quotations are not only useful for vendors in generating business, but to the purchaser, as they use them to see where they can obtain the best deal for them. All that is necessary if for you to download them, edit them and either save them to file or print. Generating business and keeping it is how a properly run business functions and survives, and good documentation is a huge part of that process. By using our templates you are guaranteed to have a convenient and cost effective method of creating quotes and managing customer/business relations. Service quote formats are used by vendors and purchasers. Businesses which offer services to clients use service quotes as a way to layout and outline the services, costs, labor, payment terms, any discounts or fees, along with dates and contact information. 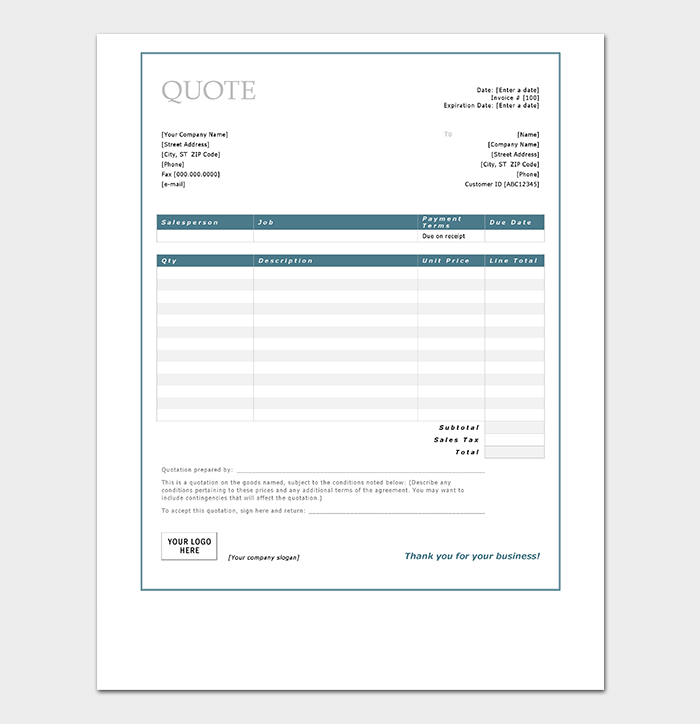 Purchasers can use these service quotation templates as a handy way to obtain the best deal for their particular need. They simply obtain the quotes and use them to do comparison shopping for the best deal on the service they need. Our service quotes are designed in such a way as to make this complex task an easy one for both vendor and purchaser alike. By using our service quotes customer transactions will go smoothly and your business will have proper documentation of each customer transaction. Whether you are a home based business of one, or a larger business which employs many, the price quote template is a necessary way to convey the various costs that a business will charge a customer. 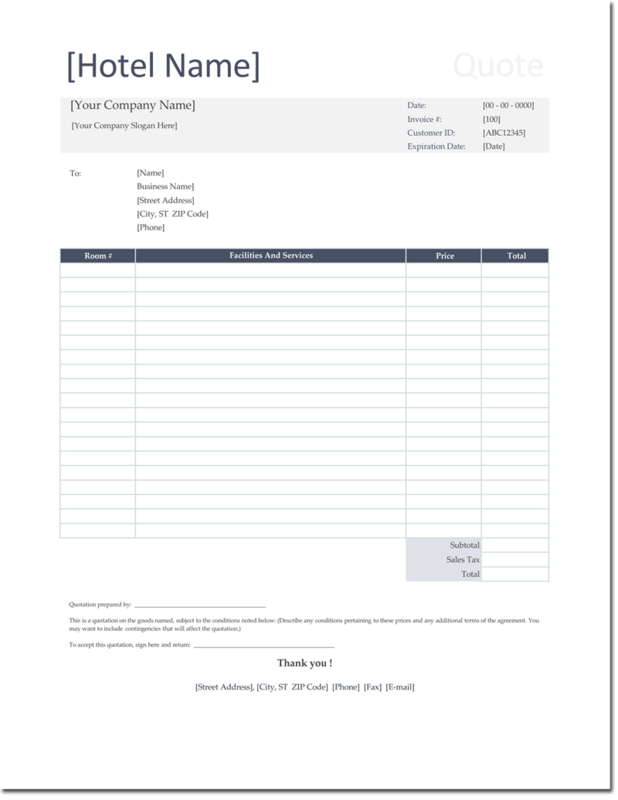 By using this form, the customer can then make a decision as to which company they will do business with by obtaining price quotes from different companies. As can be seen, it’s to the companies benefit to make sure they have the best and most comprehensive price quotation form available. 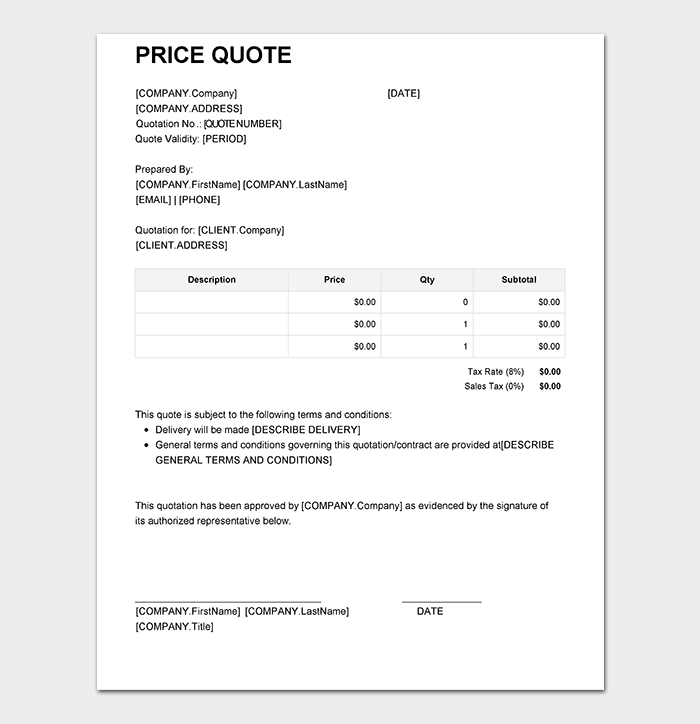 Price quotations can also be used by businesses as a form of advertising. For example, think of that flyer that you found stuck in your door, advertising either a neighborhood car repair shop, or garage door repair business. Simply download them, edit them and save them or print them out. There are occasions when a business must decide whether to charge an hourly rate for work to be completed, or a fixed flat rate. 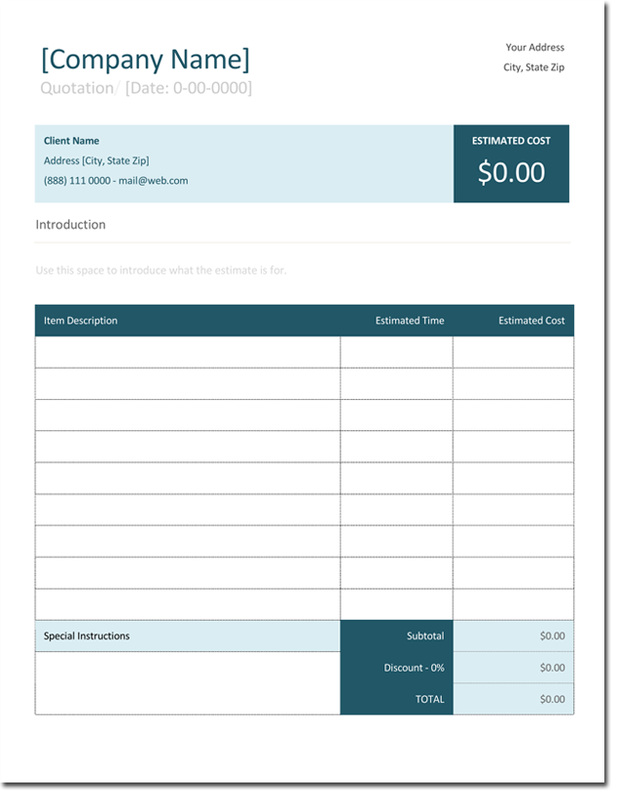 When a business decides to charge for services on an hourly basis, they will use hourly quote forms. These formats contain fields for contact information, type of service and its detailed description, payment terms, fees, discounts, important dates and the cost per hour. Templates that we have designed are easy to use and free to download. It will just take you a few moments to click download, then take your time as you customize the hourly price quotation template to suit your particular needs, and either save it or print it out. 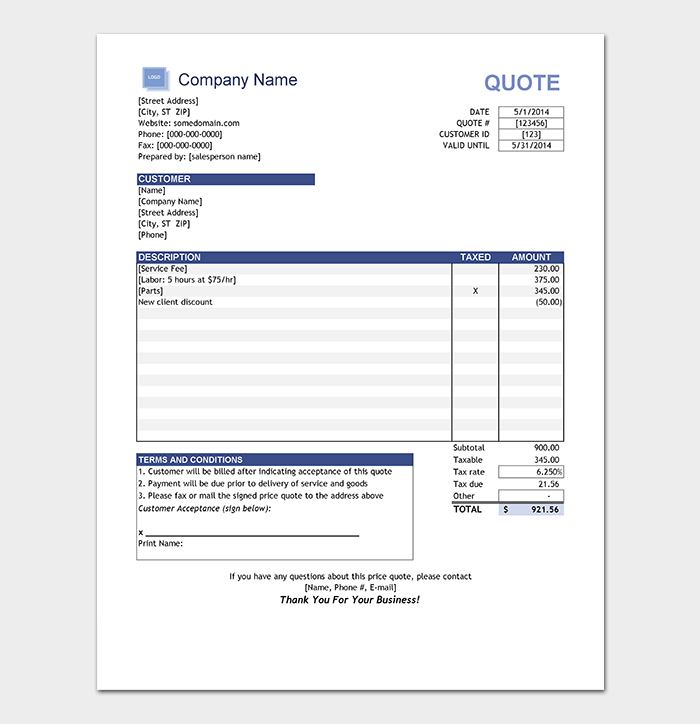 Thus, by using our hourly price Quotation templates you will not waste time with over priced invoice creation software, and instead, with one simple click of the mouse, have the perfect quote template at your disposal for your specific business needs. Some businesses, such as construction companies, must bid for certain projects. As a result, they formulate a bid proposal and present it to a company. The company then decides which bid proposal they prefer. As can be seen, a bid quote template is life blood for such businesses. The form must be concise and easy to read and comprehend, explaining the bid to the company in a logical manner. These templates are a way for such businesses to ensure that their bid proposal is completed in a professional way, thus making sure it will be considered, and not be overlooked in favor of a competitors bid proposal. 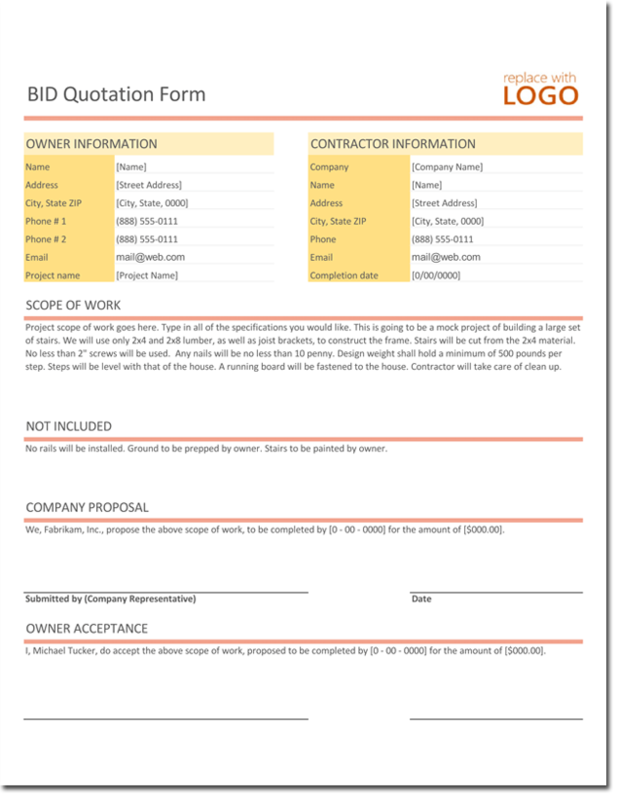 Our bid quotes are free to download and can be easily edited by using Microsoft® Office. 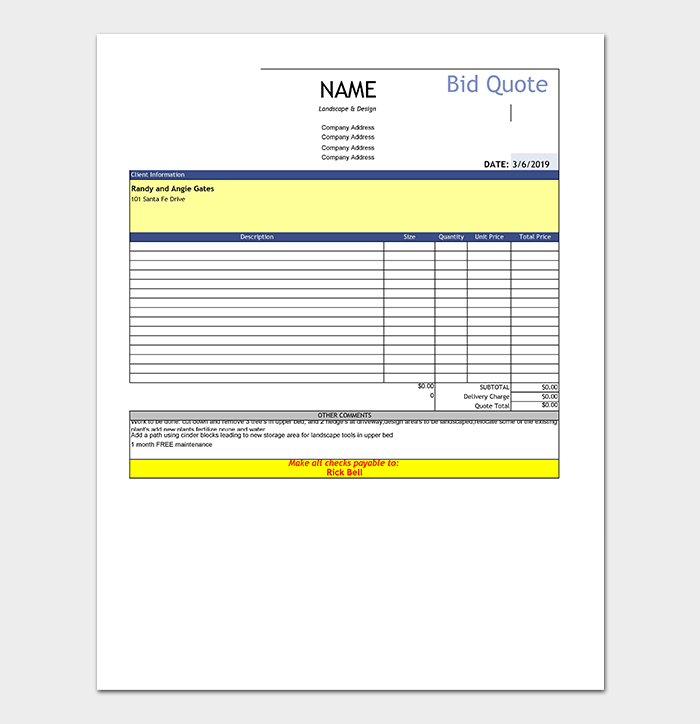 Indeed, by using our professionally designed bid quotations you will have a cost effective and convenient way to create excellent bid quote documents for your clients and your own business records. Construction is a complex business. It involves not only tabulation of man hours worked, but also supplies and materials used. As a result construction quotation templates are employed. When an individual or businesses contacts a contractor for a quote, the contractor will make an assessment of the job at hand, then present them with a construction quote which includes estimated cost of man hours, payment terms, materials and supplies. Such transactions can be tricky and complex. 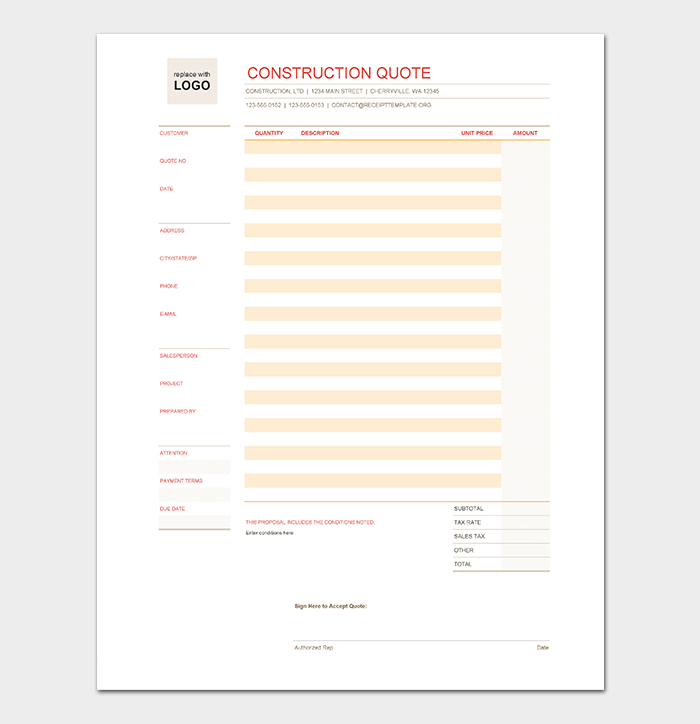 As a result, construction quote formats are used. Our templates are designed with the job at hand in mind, and are therefore easy to fill out, and contain all the necessary fields required. After you download and edit your construction formats, you are free to either save it to file or print out the results. 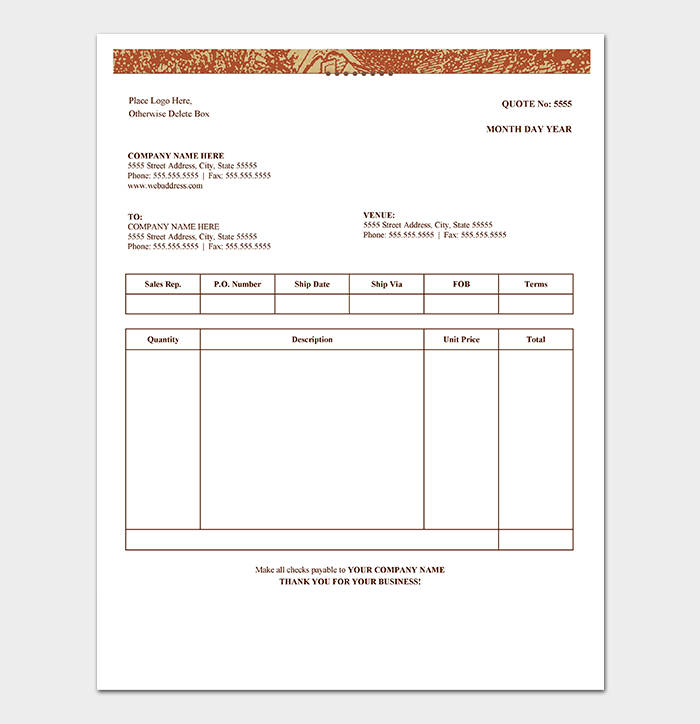 An Export quotation Worksheet assists vendors and purchasers in ironing out an agreement before the actual transaction. 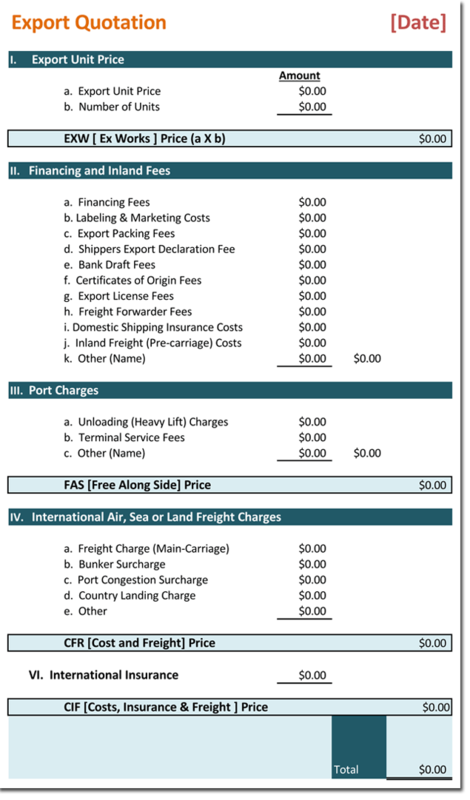 This worksheet is considered an in-house document which is utilized to make sure that each and every cost consideration regarding an export transaction are verified and tabulated. The worksheet has specific fields which host information pertinent to the special needs of exporting products. Information includes: Dates, contact information, the country of destination, payment and sales terms, port/place of delivery, shipping and handling information such as freight and insurance costs, along with any bank fees and charges. 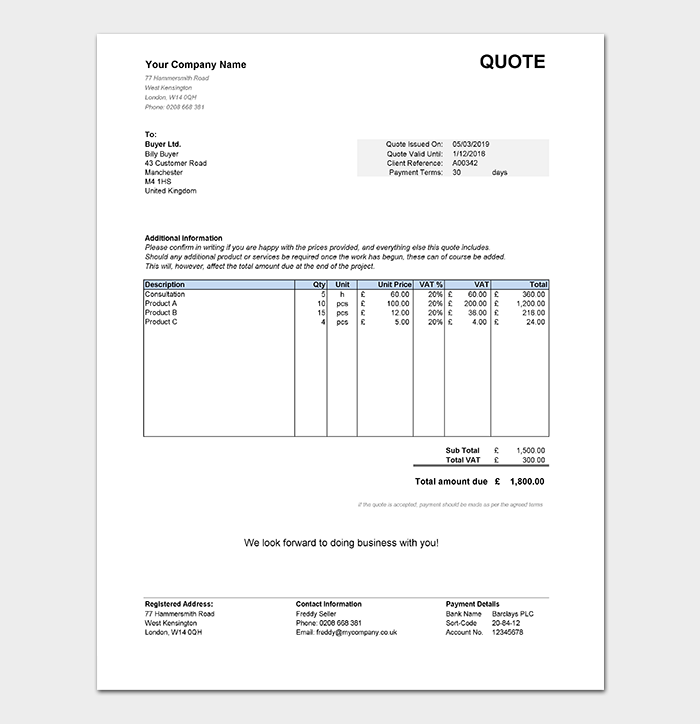 The export quote worksheet is also used for Pro Forma Invoice preparations. They are easy to use and customize. Simply download, edit and print or save to file. Export is a complex business, and by using our worksheets you are ensured to have a document that is always up to date and correct in form and policy. 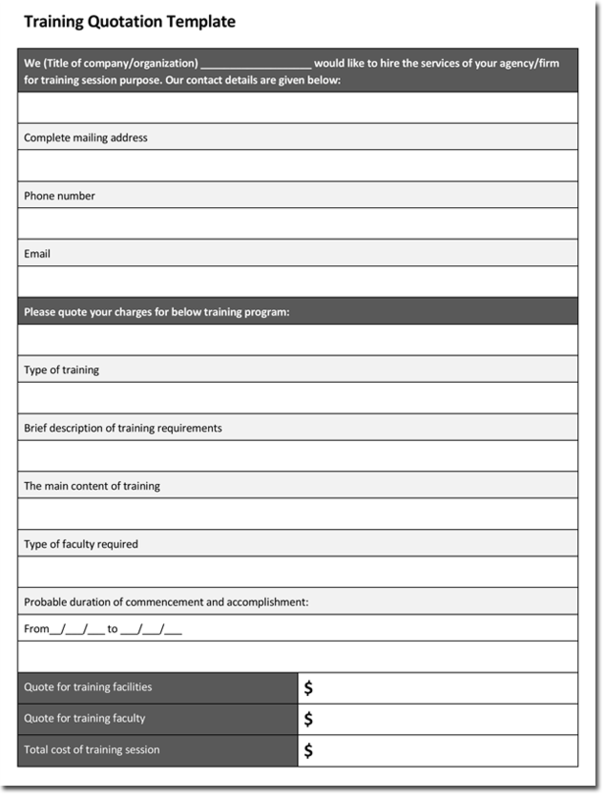 Training Quotation templates are used by companies that offer specific training, such as office training, tutoring, or personal exercise training. Indeed, whatever subject needs to be taught, from training your dog, to instructing large groups in the use of computer software basics, training quotes are necessary to the process. Since the nature of the subject, training, is widely varied, the use of forms is often utilized. These forms have information about the company as well as the type of training sessions provided for the cost stated. Some training formats will also include any payment terms as well as contract between the student and instructor, which includes payment terms, cancellation policy, make ups and areas for signatures. Dates of each lesson and time may also be included. As can be seen, there is much that must go into each form. 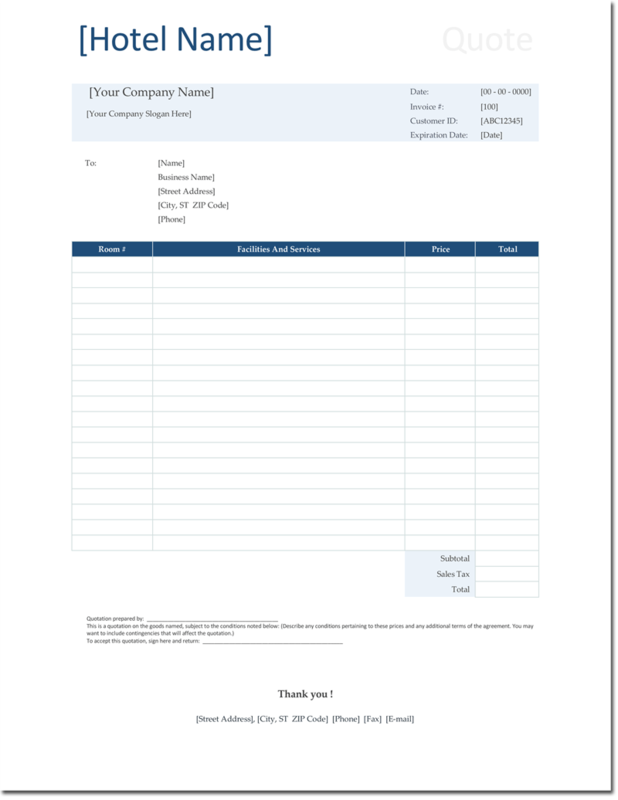 As a result, training Quotation templates are used. Our training quote templates are specifically created to give you the freedom you need to create logical and comprehensible, business documents that will aid you in spelling out exactly what will be required of student and instructor. Job quotation formats are necessary when an individual or business is requesting a quote for a particular job to be completed. 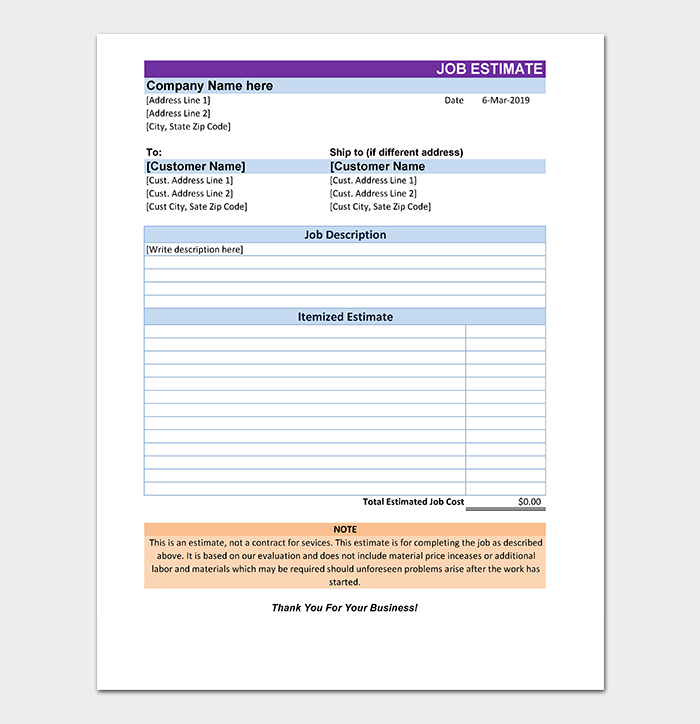 The job quotation form is also called a work estimate quote. The format is filled out and completed after the preliminary assessment of a job and it’s cost has been determined. These forms often include a ‘Not to Exceed’ field, where it specifically stipulates that the final cost will not exceed that number. These formats may be binding or not binding. Binding refers to a fixed price agreement, whereas the non binding is an approximate number. 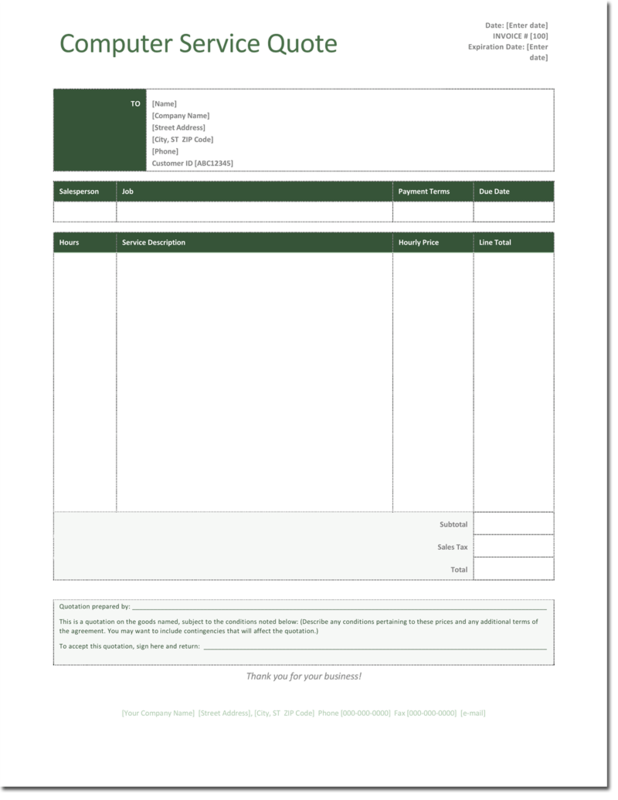 By downloading and using our free templates the task of creating an orderly and concise layout of the form is an easy one. 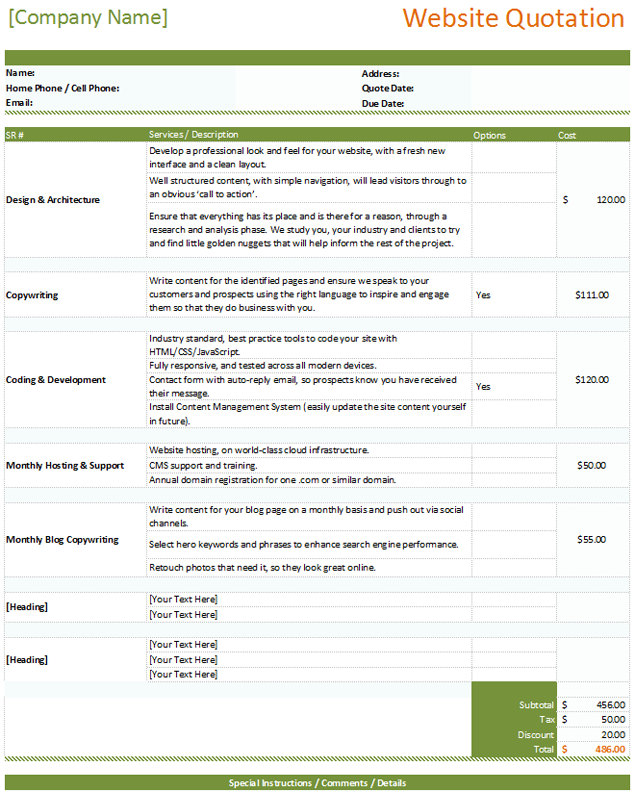 By using these templates you will find that it will increase your productivity by giving you an easy and cost effective way to produce price quotes for each unique and specific job. We love our homes, and take great pride in their appearance, both inside and out. A large part of the aesthetics of home ownership resides in the quality of a professional paint job. Whether you are a business or homeowner, there may come a time that you wish to refresh your decor and environment with a new paint job. Professional painting contractors use painting job quotation templates in order to assess the job at hand and write up a price quote for a customer. The customer then compares each painting form and decides on the best deal for them. 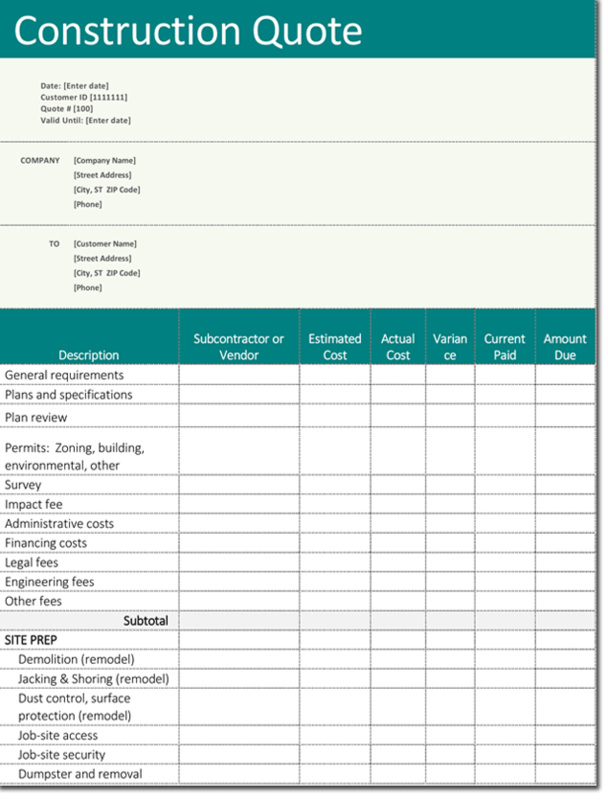 These templates are a useful tool for painting contractors to outline their assessment, man hours, payment terms, discounts, materials and supplies in one convenient, easy to comprehend form. Our formats are easy to use, and edit to your specific job requirements. By using one of our templates you are assured that your relationship with your client will be a smooth one. Photographs are important memories of family, events, fun times and special occasions. When the occasion requires more professionalism than a selfie stick, a professional photographer is contacted to do the job. 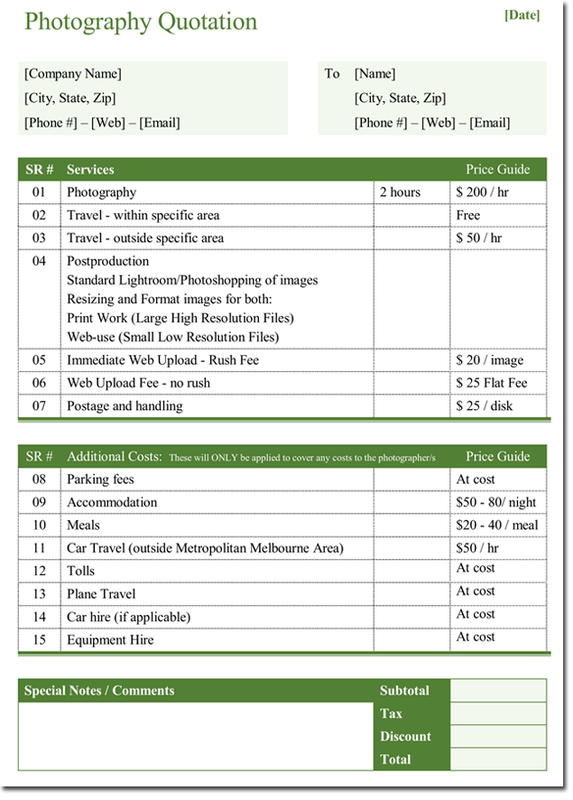 The photography quotation template is quite similar to the service quote form, except it often contains ways to charge for services in different ways. For example, a photographer may charge for photographs depending on whether it’s going to be done outside, or within a studio, flat rate, or hourly. Plus they must often offer different variations of each offer. Such as the same offer may have different layouts. Indeed, a form can be a complex form. As a result, quotes are used as a cost effective way to logically outline the job at hand. Building quote forms are used by construction outfits or the local handyman. When an individual or business requires any form of construction or home improvement jobs done, they contact builders or handymen. Because of the vast amount of variables regarding supplies, quantities, materials and labor costs, it is an absolute must that forms be utilized. 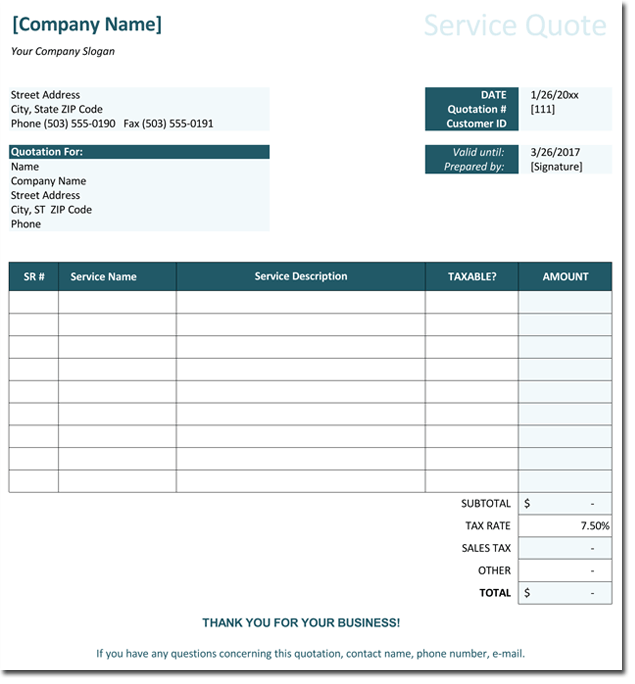 Similar to other service forms, building quotes include contact information, dates, payment terms and any discounts. However, they must be customizable enough to include the description, quantity and product name of any material or supply used. Also, it needs to be addressed as to whether labor will be at a fixed cost or hourly rate. As a result of the complex nature of the task at hand, builders use building quotation templates. Our templates are easy to use and free to download. Simply download, edit and save to file or print. It’s just that simple. Catering is a must for those who not only love to entertain groups of people, but for banquets, weddings, corporate events and family reunions, to name but a few. Catering is a business that is highly situation specific for every situation. For example, there is the different menu choices, the number of people in the party, the amount of servers required, as well as any alterations such as making allowances for individuals with food allergies. 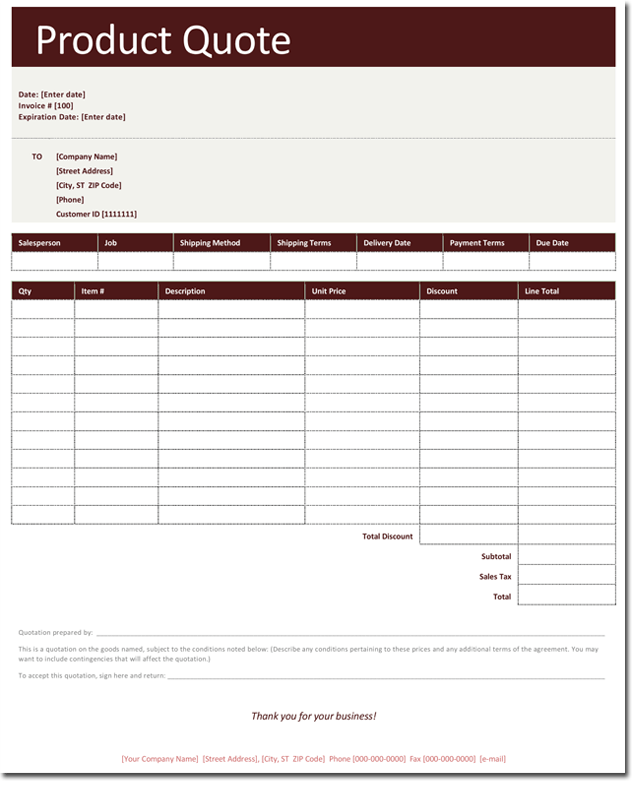 With such a vast variety of variables, catering quotation forms can become quite complex. In order to straighten out the complexities of the situation and create a readable, comprehensive outline of services and costs, catering quotes are used. A catering template will have fields for contact information, date and time, menu, number of guests, payment terms and any discounts. 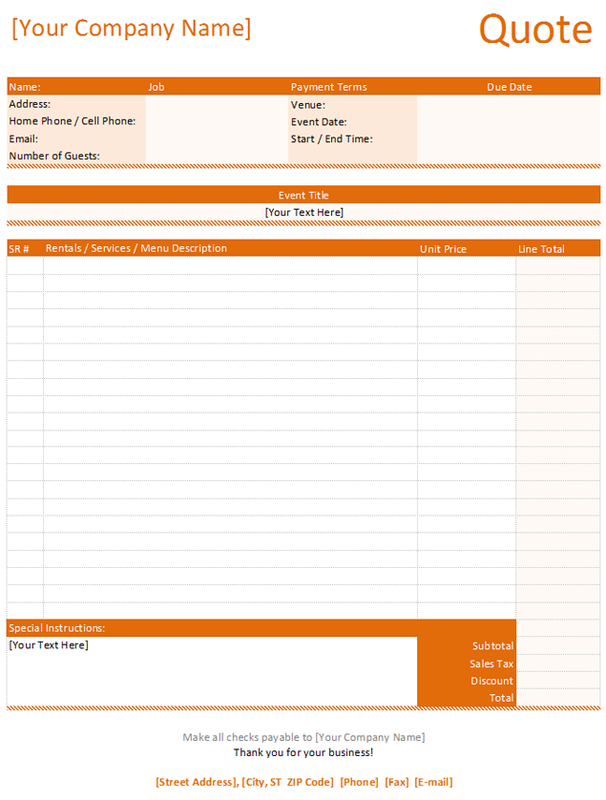 Our catering quote templates are available for free to download for Microsoft Excel® or Word. Easy to edit, simply download and enter your information. 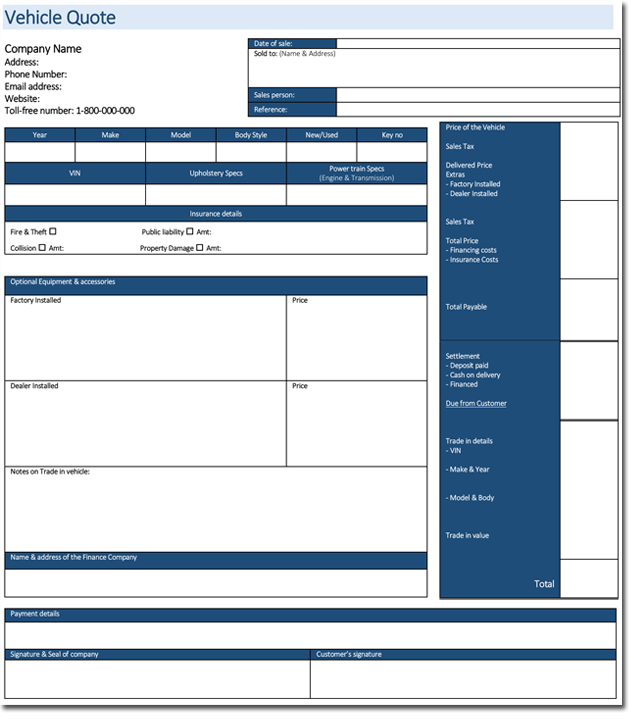 Design quotation forms are used not only for businesses but also by freelancers. Whether the business involves interior design, stage design, fashion design or stage design, the regular use of design quote forms takes the pain out of client/business transactions. For instance both interior designers and fashion designers offer services where the materials and supplies will vary from job to job, as well as whether to charge a fixed flat rate or hourly rate for labor. By the same token, graphic designers must also weigh the different aspects of their jobs. From advertising to web design, graphic artists are finding a niche for themselves as freelance workers. Whether it is being hired to design a logo for a business, brochures, business cards or even working on power point presentations for corporations, the graphic designer must have a way to itemize and describe their services, and they do this via a design form. 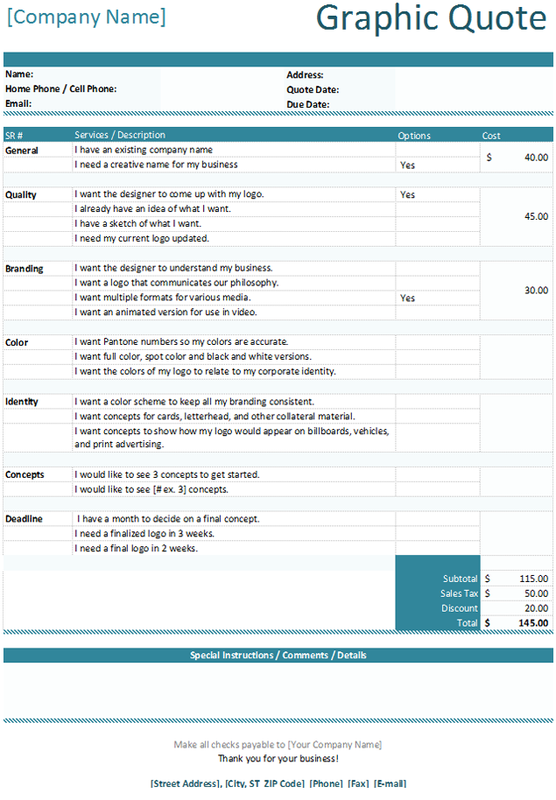 The design quote template will detail whether this job is to be hourly or fixed rate. it will also consider any added printing costs, photography costs, illustrations, as well as shipping and handling if the project must be shipped. Creating a website for a business is a complex and challenging task. There are many variables to consider, as well as the time involved. Hence website quotation templates are an absolute must in order to make certain that all variables are covered. Templates that are to be considered with website quotations include company name, logo design, type of website design. estimated date of delivery for the website, content architecture planning, CMS ready, any considerations such as ability to update, section for contact forms as well as number of pages, search engines, and any blogs. Simply download the website quote template, customize it using Microsoft Word or Excel®, and either save it to file or print. By using our formats you can be assured that your client/business interaction will be smooth and profitable. There are many good things that a well written quotation will bring to your business. It will demonstrate the professionalism of your business, it will market you by attracting new customers, it will meet your business trading and consumer obligations. A well written quote will also protect your business from legal and financial risks. Your business details are part of legal requirement. These details are the contact information of your business and the Business Number. Also include any other detail that proves the legality of your business. List all the details that the job to be done involves. Indicate what the cost will cover. You can also indicate what the cost will not cover if there is need to do so. Example, you may just be charging labor and offering free delivery. Indicating this will show good customer care and earn credit to your business. Give a detailed description of the job proposal and all the elements involved. List all the items that will be involved in this job and the cost of each of the items. This shows transparency and professionalism that will help build your business. Give a detail on how some scenarios may affect the costing. For example, if there is an additional responsibility that was not communicated, the cost will rise to a certain percentage. This will help in avoiding any misunderstanding when planning the job. Once you have started the job, you can revise on the quote and see what may need adjustments. The duration on which you will take on the task is important to indicate in the quotation. Make sure that you give the appropriate time that you are sure you will have been through with the job, keep in mind that it should not be longer than expected. This is very important to indicate to avoid any misunderstanding. There are several ways in which you can indicate this. You may want it in lump-sum, Periodical payments, half upfront and half on completion. Be clear on when you need your quote to be accepted. There are some factors that may affect the quote that takes too long to approve such as the prices in your industry as well the season of the job. There are seasons where the demand for your service may be high. Indicate this in the quotation to be able to get convenient response. This is an important document and including the customer’s signature is important in sealing the deal. Include a space for signing to seal the agreement. For example, I (name), accept the above terms and conditions. Signed__________ Date____________. The method of payment is just like the payment terms. This should be indicated in the quote especially if you will need to be given a deposit before starting the job. 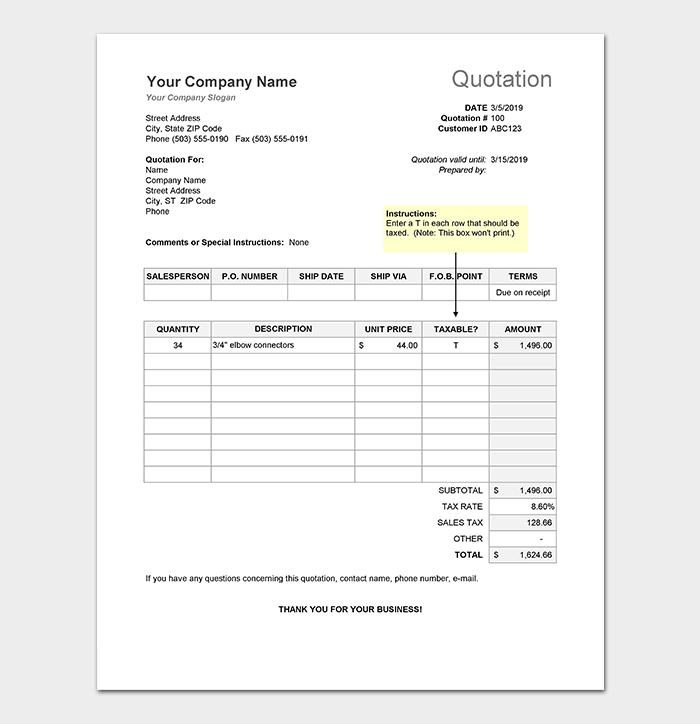 Many people often get confused between a quote and an invoice, but these are two different documents when it comes to business and money. This is a response to RFQ (request for quotation). It can be in verbal communication at some instances. It is only issued in written communication. Quote in writing: A quote can either be verbal or written. The best one is always done in writing. This will make it look more professional and avoid any inconvenience or miscommunication. Add Value: Consider quoting a competitive price for your services so that you can stand out and get the opportunity of the job. Remember most customers tend to ask for more than one quote to be able to pick the best in terms of quality and price. Quote what you can offer: Do not exaggerate in terms of price, time and quality. Make sure your quote involves that which you are certain you can deliver. Do a follow up: The quote has an expiry date, and this depends on the request for quote from the customer. Without nagging the customer, make a formal and polite reminder to the customer about the job. This is professional. After the quote is accepted, be professional by confirming the arrangement using a written document. If there is a change on the job, you can provide a revised quote. This will help the customer and you on the way forward about the task at hand. Indicate the risks that may be involved in the business when writing the quotation. Include a clause that will protect you and the customer in cases where these risks may arise. Because this is a legal binding document, it is always important to seek recommendations from the office of fairing trade on how best to prepare this quote. The best way to send a price quote is through Email. The document should be in PDF. The reason for putting it in PDF is to make sure that it cannot be edited. Make sure you don’t sent a price quote in excel form.